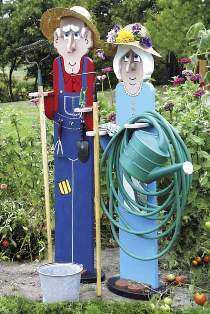 Mr. and Mrs. Brown keep your garden tools at the ready. Prevent having to lay your rake on the ground when you switch to the shovel. Easy to make from a length of "2x12" with 3/4" pine overlays. Projects stand alone in the garden or attach to side of shed or garage under roof overhang. So realistic they are better than scarecrows. Mr. Brown measures approximately 6 feet tall. All patterns drawn FULL SIZE.